C J Skuse. I salute you. This book brings a darker dimension to the idea of boarding schools. Where Harry Potter had a magical nemesis and Malory Towers was focusing on the issues of growing up, Monster and the girls at Bathory have to face the consequences of a terrible winter and a myth come real. C J Skuse keeps a fast paced (from about 25% in) and intense story line which, not unlike a murder mystery will keep the reader guessing what is real and what is simply make believe. 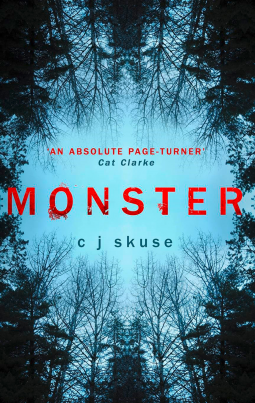 The cover adequately provides the idea that although the “monster” can be seen and is well known, the real one can hide under the surface, or behind the trees. Nash is aiming to be Head Girl at Bathory, perfect grades and behaviour but when her brother goes missing and Christmas is in turmoil she slips and loses the ball. Befriending Maggie, the school delinquent and making a move on Charlie the local village boy, her life appears steady when inside she is exploding. All that she has learned from those around her will help her be able to continue and act when most needed. C J Skuse has created a world that while not devoid of technology, seems to lack the modernity of many English boarding schools today and along with a draconian approach to Holiday boarders creates a harsh and uninviting environment. While the world building takes place, there is a lack of perceivable forwarding of the plot. Although this detail is important in the long hall it may put off some readers who are unaware of a much deeper and complex plot later in the book. There are constant links within the book to where and who is the monster that haunts them. There are a couple red herring’s and a whole lot of dark and mysterious, even deadly consequences. What I really loved about this book is how the title connects to the plot and then also to Nash who begins to question herself and others about what and who are monsters. This added element adds a complex understanding to Nash’s character and allows for more mature readers to enjoy the read. The themes in this book allow for a deeper and more connected understanding to the characters fears and thoughts and as a reader you learn what each character will do in a situation as it presents itself. C J Skuse also effectively manages to team the suspense and “reward” of the situations in a way that gratifies and excites the reader. Overall this book is a solid 4.5*’s and definitely recommended to friends! Previous Post A Nerd filled Summer.